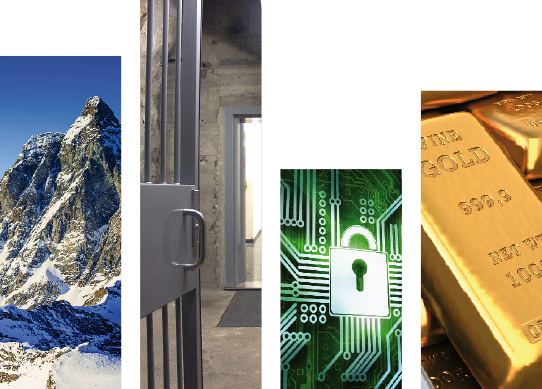 Based on company-owned, thoroughly modernized former Swiss Army command bunkers deep in the solid rock of the Alps, Swiss Data Safa AG provides unique, integrated high-security solutions for corporate and private clients. Your most sensitive and critical information and data, safely communicated via highly encrypted channels, always available, stored and operated in high-security data centers, and your most valuable assets, safely deposited in private, specially conditioned high-security vaults, this is what Swiss Data Safe stands for. The weakest link of the security chain defines overall security. Consequently, in all projects, each single aspect of security, tangible and intangible, is identified and considered, and this with a structured approach along the dimensions environmental-, information-, physical- and operational security. Swiss Data Safe is an independent Swiss company that owns and runs its own high-security facilities based on former army bunkers deep in the Swiss mountains. Be it business critical systems, applications or data, precious metals, diamonds, jewelry, works of art, antique cars or other individual objects of high value, we provide customized, integrated high-security solutions in line with your safety and security needs. The safest place on earth, originally built for the Swiss government, is just good enough to protect what you value most. What you see is what you get. If you are a registered user, to access Secure WorkSpace® please go to the portal.